Suite Hotels in Times Square offer both leisure and business travelers additional space, kitchens and multiple room suites. They are often similar to a NYC apartment vacation rental, and many times, more budget friendly. 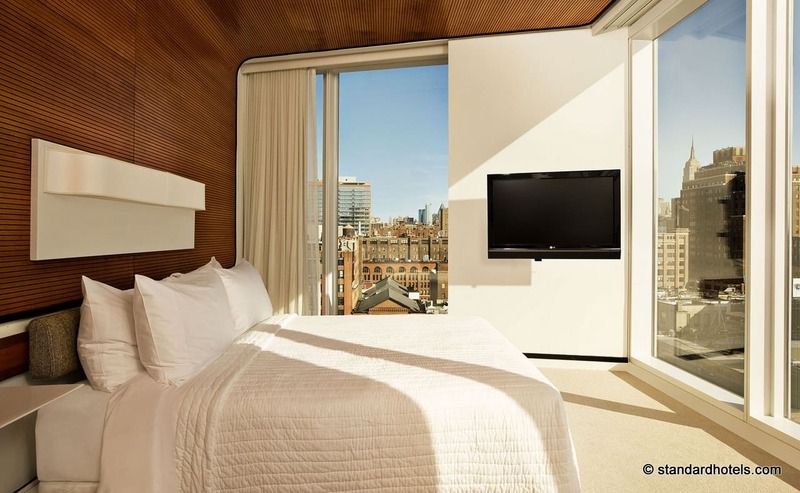 Here are some of the best Times Square suite hotels. 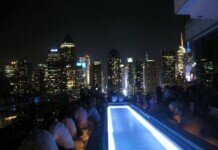 Make sure to also download our free neighborhood guide to Times Square and review dozens of other Suite Hotels in NYC. The AKA Times Square offers modern and sophisticated studio, one and two-bedroom suites, all with kitchens, washers/dryers and some with great city views. Recent reviews say, "One of the best 2 bedroom apartment I had ever stayed, hands down." At various times of year, they may have a minimun stay of 4 nights, so if the hotel looks unavailable online for shorter stays, try adding a few days to your search to see pricing. 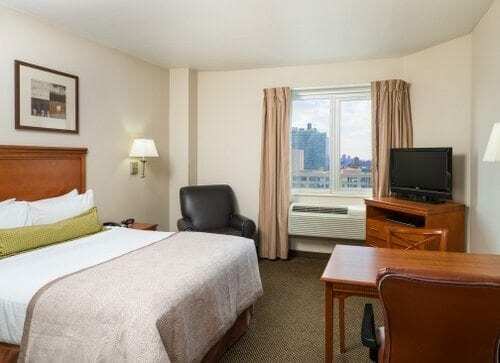 Just a few blocks off Times Square, the Candlewood Suites stylish studios have full kitchens, comfortable work and living spaces, modern amenities, plush beds, 32" flat-screen TVs, alarm clock, DVD player, voicemail and free Wi-Fi. The "suites" are mostly 1 room each, but all have work spaces and kitchens and some with 2 double beds and pet-friendly. Doubletree Suites Times Square boasts over 450 suites, many of which can accomodate five or six people, twelve conference suites and two, two-bedroom “presidential” style suites. 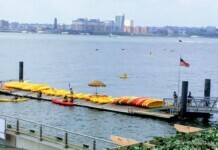 The hotel is known for providing some of the largest rooms in NYC. All suites are intended to provide a “home” like atmosphere and include kitchenette facilities, work areas, comprehensive electronics and luxury toiletries and linens. Offering guests several dining area and lounges, pool and fitness center and complete business services, the hotel appeals to both business and leisure travelers. The New Orleans inspired French Quarters Guest Apartments are a tremendous hit in NYC with rave reviews. Their uniquely-decorated suites include luxury bedding and linens, kitchenettes, plasma TV’s with DVD players, complimentary wireless Internet access, and more. The two bedroom suites all feature private balconies. Located slightly off Times Square, in Hell’s Kitchen, The Homewood Suites Times Square features daily complimentary hot breakfast and dinner on some week nights, modern fitness center and laundry facilities. 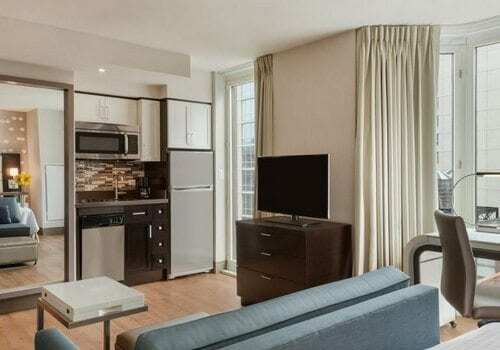 Each studio and suite has a kitchenette, flat-screen HD cable TV and free Wi-Fi access is available. 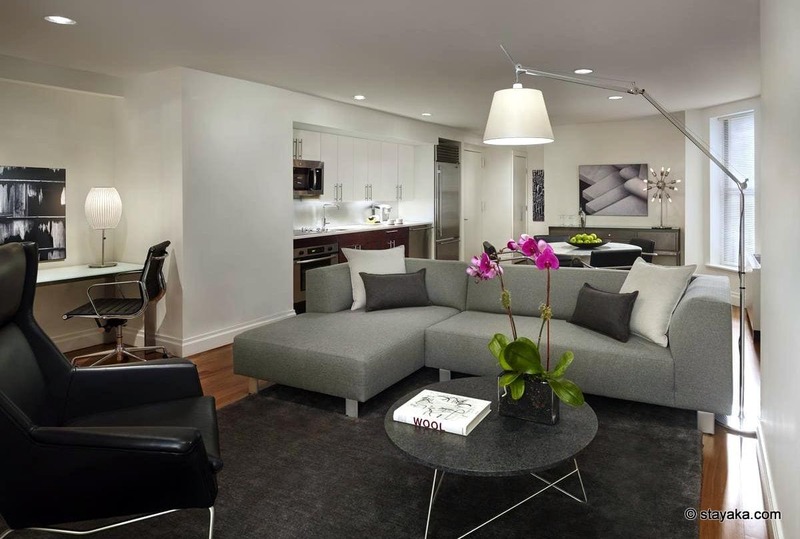 The rooms of the Radio City Apartments New York City are comfortable and contemporary, and all one or two bedroom apartments. Like apartments, the rooms have en suite bathrooms and kitchens where guests can cook their own meals. The kitchens are stocked with cooking and eating utensils necessary for the comfort and convenience of guests. All of the rooms have cable televisions and telephones. A solid NYC Insider Guide Bestseller for years! The Staybridge Suites Times Square offers several room types: studio with a King Bed, Queen Bed or Two Double Beds, with a maximum occupancy of 4 people. Each room offers a kitchen, work space, radio, TV and paid WiFi (free for IHG members). The hotel has a fitness center, concierge, business center, housekeeping, free coffee and tea and an evening reception several nights per week. The Premier Times Square by Millennium – Each room at The Premier is designed to resemble a studio apartment, boasting floor to ceiling windows, a sofa, stand alone shower, European Soaking Tub, and flat screen TV’s. 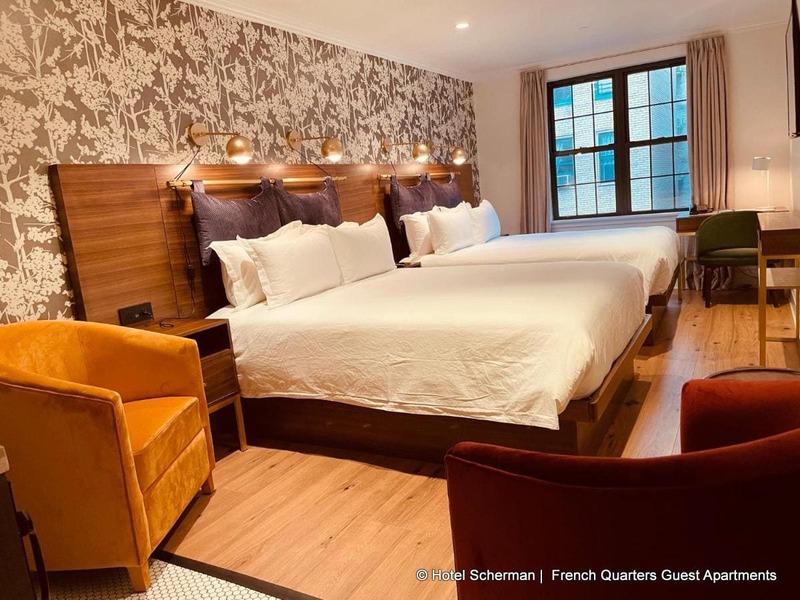 TRYP by Wyndham New York Times Square – While they don’t offer traditional suites, the Wyndham does have multiple ‘family’ rooms with double beds and bunk beds. Download over 100 pages of NYC maps, information and recommendations in less than 5 minutes! 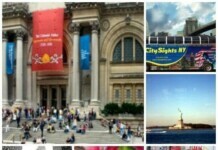 Our NYC Insider Printable Map Guide Book includes organized, easy to follow, color coded guides to NYC, detailed maps of every neighborhood, weekly chart of Free Museum Days and Times and free weekly neighborhood tours, Best of NYC Categories and lists by ALL native New Yorkers and much more. The New York City Travel Guide is your NYC PRE VACATION Guide, sort of like, “New York City 101.” This book is an overview of NYC to help you PLAN your trip so you make the absolute MOST of your time and money here. 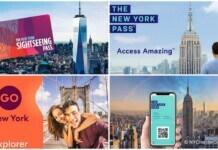 Think of this book as the guide to answer all the most commonly asked questions and avoid the most common NYC Vacation and Trip Planning mistakes. The NYC Map Printable Bonus Guide is a 14 page downloadable Bonus Guide, compiled of the best free, downloadable local neighborhood maps with stores and shops block by block put together by our local NYC neighborhood associations; all formatted and ready for you to print.